Mention the name Ivan Hrvatska to people and you might get some confused looks and questions like "Who is he?" Mention Ivan to people in the Canadian city of Vancouver and they will know him if not by name then by his locally famous song, "Making Love to the Vancouver Canucks" which was chosen to be an official party song by the fans for that city's NHL hockey team. But Ivan Hrvatska isn't resting on his laurels. He has already released an album, released another song about the World Cup that drew rave reviews and is planning a tour in 2007. So exactly who is Ivan Hrvatska? Hailing from Dalmatia and with origins from Trogir and Brac, Ivan was exposed to music from an early age. His first experience with music was listening to his father and uncles sing while drinking wine as well as listening to his grandfather singing at church. Ivan jokingly says that his background is "half trained singer and half wine." As a teenager, Ivan learned to play bass guitar and started performing in rock bands. 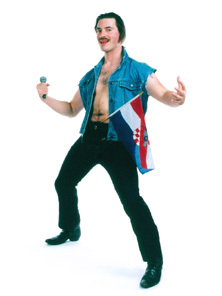 Ivan cites a varied array of musical influences from traditional Dalmatian klapa music to rock bands like AC/DC, Divlje Jagode and the Ramones. Ivan's stage name came about by chance. Although it superficially might remind people of DJ Hrvatski the electronica artist, Ivan's name came about while he was playing music at a club. The club manager asked who he was, and Ivan's reply was "Ivan from Hrvatska" the manager replied "Ok, Ivan Hrvatska, you are on!" and the name stuck. Ivan got his professional musical career started after a Canadian friend who is a musical producer asked if he could write and perform a Christmas song for a show that he was organizing. Ivan, inspired, combined romance and the holiday spirit with a song called "First I make Love to You, Then Christmas." The producer loved the song so much that he invited Ivan into the studio to record a studio version of the song. The song was later released and started to get played on various Vancouver radio stations and drew rave reviews. It was Ivan's first hit. Ivan's success with his Christmas song inspired him to write a song about the Vancouver Canucks. While it is unusual for a hockey team to have a fan song, Ivan drew upon soccer songs and his love for the team, and added some "party and Croatia into the mix" as Ivan put it, and it became an instant hit. The song also features Croatian lyrics. Entitled "Making Love to the Vancouver Canucks," the song became so popular that it was voted by the Vancouver Canucks fans and not the franchise as the official party song for the hockey team for the 2005-2006 season. This year will see a remixed version of the song and will feature new players in it. With two hit songs under Ivan's belt, the idea of writing and recording a full length album soon appeared. Ivan drew on his early successes and influences of good times in Croatia and started writing party songs about every holiday. The album was recorded by producer Stephan Hamm, who also assisted in writing the songs. The album "Seasons of Love (Party All Year)" was released in 2005. Ivan's successes have not gone unnoticed. He receives messages of support from around the world by Croatians and non-Croatians alike. Ivan says that many Croatians write in to say that they are proud of him and his accomplishments and they want to hear more. Ivan's successes and the positive response from his fans have encouraged him to keep writing and performing. For the 2006 World Cup, Ivan composed and recorded a song called "World Cup Party 2006." CBC Radio Canada aired the song over their network, throughout Canada. Ivan's most recent concert was in New York City. Ivan also released a song honoring the New York Police Department called "The NYPD is a Good Time" that was well-received by the NYPD. Additionally, Ivan says that he will keep writing party songs and theme songs for TV, radio and commercials. He even has a song for the Super Bowl that is ready to be recorded. Ivan is also working on two follow up albums, one in English and another in Croatian. The tentative scheduled release dates for both are January 2007. To order Ivan Hrvatska's album "Seasons of Love (Party All year)", listen to audio clips, get updated tour dates, or to contact him, visit his website at http://www.ivanhrvatska.com. Ivan is also on myspace at http://www.myspace.com/ivanhrvatska. IVAN HRVATSKA IS THE BEST! !